In 1979, the year Morton Feldman composed Violin and Orchestra, he was just starting to write the works of extreme length that characterized the rest of his composing career. Pieces of ninety minutes or more, like his first string quartet from that same year of 1979, became commonplace, with even longer compositions, like the five-hour For Philip Guston (1984) and the six-hour Quartet No. 2 (1983), soon to follow. The last, and longest, of his series of pieces for solo instrument and orchestra with simple descriptive titles – Piano and Orchestra, Oboe and Orchestra, and so on – Violin and Orchestra encompasses over 1,500 bars of music and takes nearly an hour to perform. Much more diverse, even fast-changing, than those later Feldman works – with their open spaces and long-ringing chords – Violin and Orchestra still maintains throughout its duration an almost entirely quiet dynamic, and slow tempo. Alex Ross’s characterization of Feldman’s music as “glacially slow and snowily soft” generally applies here. The piece develops but slowly, and seems almost static at times. Color, not structure, was Feldman’s obsession. The ear is entranced by the constantly-shifting textures. While the music is harmonically dissonant, the textures are so evocative and carefully chosen and weighed that the effect is quite lovely, mysterious and ethereal. By Feldman’s standard, the orchestra is huge: four of each woodwind, a large brass section, two harps, two pianos, and four percussionists. But they’re usually heard in small ensembles, and rarely massed together. The solo violin is muted throughout the work, and the performer is seated within the orchestra, not in front of it in the usual manner. Its contribution, dominated by spare notes, arpeggios, and glissandi, isn’t elaborate or virtuosic, but it is demanding in terms of concentration and precision of pitch and color. The interaction between the violin and orchestra is rarely what we would normally think of as concerto-like – there is no sense of contest, nor even a melody line and accompaniment in the normal sense. The tolling piano over timpani rolls, followed by other restrained percussion, heard early on in the work recur in a more aggressive form about four minutes from the end of the piece. Just before the twenty-one minute mark, the music fades to inaudibility, followed by a brief passage of more ominous, not-quite-scherzo-like material. A marvelous moment occurs around thirty-two minutes in, when the orchestral strings engage in glissandi that sound like the distant blowing of wind (or, interpreted more ominously, distant sirens). But it is soon interrupted by the vaguely jazzy tapping of wood blocks and other tuned percussion. Seven or eight minutes later, the music dwindles to a few isolated chords, separated by several seconds of silence. Spiraling arpeggios toward the end devolve into simple repeated notes from the violin for the work’s enigmatic conclusion. There are some repeating motifs – glissandi from the violin, short repeated chords from the woodwind choir, rumblings from the timpani and the lower part of the piano, a step-wise series of descending chords from the violin and orchestra, repeating pulsations from lower-pitched instruments that evoke some kind of funeral procession (including one extended passage of this sort during much of the concluding three minutes of the work). But, if there is an overarching form, it isn’t apparent to the average listener, which means that the music is consistently surprising. Some of the dissonant sustained chords puts one in mind of Gyorgy Ligeti’s early orchestral works like Lontano and Atmosphères. Because much of the music is so quiet, the louder outbursts sound almost apocalyptic. But those moments are always brief, and the music immediately calms. Violin and Orchestra was first performed on April 12, 1984 in Frankfurt, with that great specialist in contemporary music, Paul Zukovsky, as soloist (the work is also dedicated to him), and Cristóbal Hallfter conducting the Hessian Radio Orchestra. But it is hard to imagine that performance surpassing the current recording. Carolin Widmann brings delicacy, poetry, and precision to the solo part, and the Orchestra under Pomarico’s direction is equally refined. 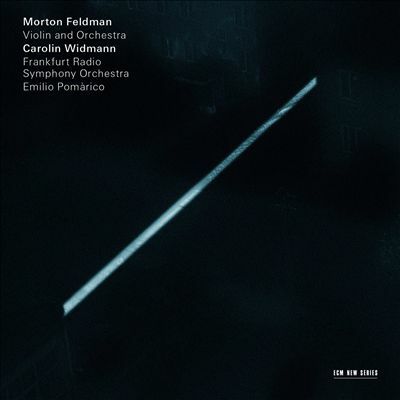 For a listener wanting to become familiar with Feldman’s evocative music, Violin and Orchestra, especially in this meticulous recording, is not a bad place to start.